Compatible with devices running on Android or iOS operating system, one needs to install Sony's free PlayMemories mobile app before use. Sony has come up with mountable camera lens for smartphones. Unlike other lenses that clip to the existing camera lens on the phone, this one doesn't. Just like a point-and-shoot, it includes a sensor, processor, memory card slot and optical zoom, minus an LCD display. It can even turn a poor camera phone or one with a camera lens into a pro. The Sony QX 10 looks like a camera lens that comes with an inbuilt battery and a memory card slot. Compatible with devices running on Android or iOS operating system, one needs to install the free Sony's PlayMemories mobile app. Using this app, the phone can be paired with the lens. The app requests for turning on the Wi-Fi and keying in the unique passcode mentioned in the manual. However, pairing it with a phone was a task. I tried using the lens with the LG Nexus 5 but the app crashed. It even failed to pair with my iPhone running on iOS 7. But once done, using it was simple. We attached the lens to our phone using the stretchable clips at the back, which makes it comfortable to clip on most of the big size smartphones too. But it can't be stretched enough to attach to a tablet. When paired, the Play Memory app launched the camera mode and was ready to click images. Settings option onboard included review image, save options, format and the image size that varied from 2MP to 18 MP. I was also able to switch between Sony's superior auto, intelligent auto and program auto modes. This is further combined with optical image stabilization. The image captured using the lens were very good, both indoors and outdoors. Colours were bright and vivid and the images were sharp. It also brings in 10x optical zoom. The lens can also be used for shooting videos. While using the lens was fun, the app took a few seconds to save the images to the device. On the other hand, the QX 10 also has a memory card slot and can capture images without the app. It has a port using which the lens can be directly mounted on a tripod and can be operated using the camera app from a distance. 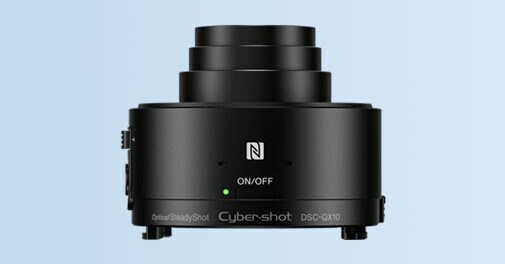 To keep a track of the battery, a tiny notification display has been added to the lens. On full charge, the lens gave us close to 130 images. The Sony QX 10 is a good camera accessory but it comes at a price.